There weren’t many dry eyes along 15th street during the afternoon of the 4th of July. Twenty-seven year old soldier Jared Plunk of Turpin was laid to rest Sunday in Liberal after his funeral in Turpin. It was a true scene of patriotism and support from the community. 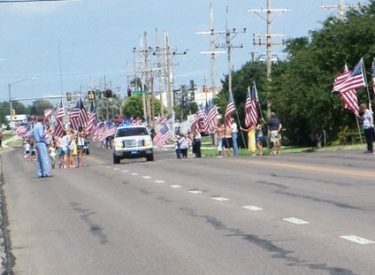 Hundreds of people lined 15th street with flags and the funeral procession arrived from Turpin. Plunk lost his life June 25 in when his mounted patrol came under small arms and rocket-propelled-grenade fire in the Konar province of Afghanistan will be laid to rest on Sunday. Plunk’s funeral was on Sunday at 2 p.m. at the Turpin High School Auditorium. Buriall followed at the Liberal City Cemetery. The family is receiving visitors at 2530 Lilac in Liberal. Plunk is a 2001 graduate of Turpin High School. He entered the U.S. Army in August of 2006. He was an infantrymen assigned to First Battalion, 327th Infantry Regiment, First Brigade Combat Team, 101st Airborne Division (Air Assault), Fort Campbell, Ky. His awards and decorations include, Army Achievement Medal; National Defense Service Medal; Iraq Campaign Medal; Global War on Terrorism Service Medal; Army Service Ribbon; Parachutists Badge; and Weapons Qualification: M4 (expert). For more information see Plunk’s full obituary in the obituary section of the website.